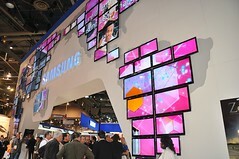 This Month on MOUBlog: CES 2011 Coverage! Starting this week and for the rest of January, MOUBlog will give our mini-coverage of the 2011 International CES (Consumer Electronics Show) - the largest consumer electronics show in the world! ...which by the way, ran from January 6-9 in Las Vegas...yes friends, it just finished today! But at MOU Blog, the party's just getting started...why? ...technologies that will leapfrog companies into market leadership positions and help others make inroads into very profitable niche markets. 3) Are so earth shattering, that you need to grab up stock in their creator-companies, as they will cause their stock-prices to go through the roof! So stay tuned, as we show you how the technologies and companies from 2011 CES, can rock your business and start-up world!